Remember a few days ago when I shared with you some information about The Descendants Book to Movie Study guide, and I hinted that I might have a giveaway that would give you a very good reason to make use of this tool? 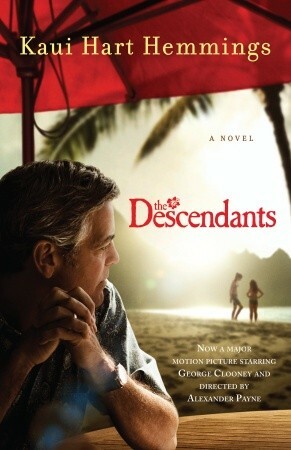 I am so excited that I have not only a copy of the novel THE DESCENDANTS by Kaui Hart Hemmings, but also a copy of the DVD! This is an ideal giveaway for those of you who haven't had a chance to read the book and see the movie yet, or for those of you who already have and just want to own them for your personal libraries. Also, I'm thinking that fans of Mr. Clooney wouldn't be too disappointed to win these either! To enter, just fill out the form below before Saturday, March 24th at 11:59 p.m. ET. I will randomly select and notify the winner the following day. This contest is open to those of you with U.S. and Canada addresses only -- no p.o. boxes please. Good luck! Thanks for the great giveaway! I have the movie in my netflix queue but haven't seen it yet, nor have I read the book! I am determined not to watch the movie until I have read the book. I have been patiently waiting to receive it from the library. This would solve that problem! Both are on my birthday wishlist! I loved loved LOVED the movie, I hadn't heard of the book until the movie came out, and would like to read it. Being widowed, the story really reasonated with me. Thanks for the giveaway!